Do you include standing abdominal exercises in your ab workout? If not, you're about to learn about the benefit of standing ab exercises. So many people get stuck on the floor for their entire ab workout, and even though I love to do ab exercises on the floor, sometimes it's good to incorporate standing ab exercises in your workout. In fitness, there is a shift to thinking about functional training. Functional training simply says that you can improve a function more so with exercise if the exercise mimics the function or action you are preparing for. If you think about sports activities and daily life activities, you'd notice that many of them are done standing up. By performing standing ab exercises, you can also work on balance and core stability, which is helpful for sports and daily activities. Here are some standing ab and core exercises. Click on the links to see more detailed instructions. Standing Cable Rotations are a great standing ab and core exercise and they work the obliques, lower back muscles, hip rotators, and shoulders. Cable Lifts also work the obliques and hip rotators, and they place a little more emphasis on the shoulders and lower back. 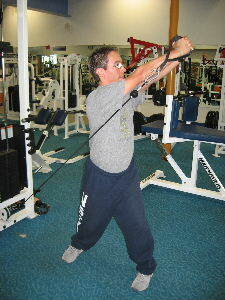 Cable Chops work the obliques, shoulders, lower back, and hip rotators. 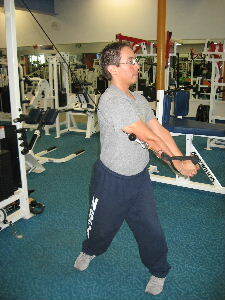 Dumbbell Side Bends a great exercise for strengthening the obliques and lower back (especially the quadratus lumborum). So often ab workouts only move in one direction- front to back. But since your spine moves in multiple directions, it is important to exercise your spine in multiple directions. Above are just a few standing ab exercises that you can include in your workout. If you've been slaving away on the floor only doing crunches, try changing up your routine a little. If you're working out at your home, you can use resistance bands or exercise tubing to simulate the exercises done of the cable machine. For more ideas about different abdominal exercises you can use in your workout, visit the Picture Directory of Ab Exercises, and don't forget to have fun with your workouts.